We hope this book will help you and your child to explore the Bible together. Along the way you will meet Moses; read about God’s special family the Israelites; and be thrilled by the wonderful things said and done by God’s perfect Son, Jesus. But most of all, we hope that reading God's special book, the Bible, will help your child to know God, who loves them. 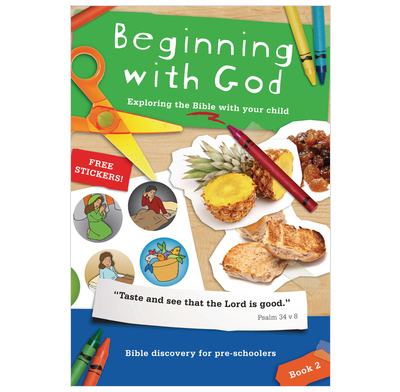 Special offer - Get The Beginner's Bible and Beginning with God - Book One for just £12.92 In today's culture so much pressure is put on us to feed our children well. We pray that this material will help those of us with pre-schoolers to nourish them with the word of God. This is a great addition to the daily routine and gets children into the swing of reading the bible each day, and gives a basis for 'right and wrong', 'grace and law' etc etc type discussions that underpin family life. Kids enjoy it too and look forward to it. This is a great buy. It is book 2 of the Beginning with God series. Each day there are suggestions for a starter activity, instructions for which story to read, simple questions, a prayer and ideas for a way of introducing the theme into a conversation later in the day. It is perfectly pitched for pre-schoolers. We don't always manage to do every bit suggested for each day, but it's great to have the options so when time (and her mood!) allows, we have it available. My just-turned two year old loves the stories and the stickers. Often I find I have to answer the questions myself (!) but as she gets older I'm sure she will become more involved in this section. For now, she is getting into a good routine of bible reading and enjoying related crafts and chat. Thank you to the Beginning with God team for another useful resource. We do what's now known as 'Bible Sticker Time' with our 3 year old son and 11 month old daughter every night once we've had our dinner. The introductory ideas are so imaginative (and are often played throughout the next day). I've just been amazed by how much my son takes it. He really understands the story and the questions. The prayer ideas are great for getting him praying somewhat independently. We're on Book 3 now and will look forward starting with Book 1 again in a few weeks! We love these books, are now using them for our second child, and still find them really helpful for talking about Bible stories. They love the games and starting activities. My only complaint is that several of our copies have had badly cut stickers which have to be torn off the sticker page. - Ed note: we've popped a spare set of stickers in the post to you. We are very impressed with the Beginning with God series. Our 3 year-old son enjoys the whole thing, from saying the prayer, to listening to the story, to counting how many questions there are, to hands up and hands in prayers, and sticker time. He doesn't always listen to the story or answer the questions correctly (he is only 3!) but it has enabled us to introduce a time where we spend time with God, looking at His word, praying together in a fun way. Our 5 year-old daughter has also enjoyed this series, although it is quite easy for her now, and she has just finished book 3 and is ready to move on to slightly more advanced notes (although nothing can quite beat stickers with little ones!) All in all we would highly recommend this resource for 2.5-5 year olds. I don't know what we will do when our son finishes book 3! Bring out book 4! We have been very impressed with the Beginning with God notes for our two children. Our 3 year-old son enjoys all aspects of the study, from saying the prayer, listening to the story, counting how many questions there are, hands up and hands in prayers, and sticker time. He doesn't always listen to the story or answer the questions correctly (being only 3! ), but he loves the whole process, and it has enabled us to introduce bible reading, study and spending time with God in a really enjoyable way. Our 5 year-old daughter loves them although they are quite easy for her now, and she has just finished book 3, so moving on to some very slightly more advanced notes (Pens). We would all, in this family, highly recommend these notes for 2.5-5 year-olds. We regularly use these (& the others in the series) for Bible times with our 1 & 3 year olds. Lots of helpful suggestions for discussions and questions about the stories, summary of the main point and a set structure which means even our 1 year old can follow and join in. Great if you are wondering how to move from just reading a story to discussing it and helping your child think more about it. This is just as good as book 1. Easy to prepare (we do it while the porridge is cooking), relevant to the kids experience of life and gets them enthusiastic about reading the Bible together. We regularly buy copies as presents for other families! Let me state at the outset my conflict of interest - I am the Marketing Director at The Good Book Company! But I'm also the father of a 3 year old and we've been doing Beginning with God together for the past month or two. We used to read the Beginner's Bible before, but the structure of Beginning with God has proved much more effective for helping Susie understand and remember the main points of the passage and to pray a simple prayer with me at the end. I agree absolutely with the reviews pointing out the issues with the stickers in book 2 (and I know the print department are working hard on a solution) but our experience was that whilst this made using the stickers harder to use, it definitely didn't ruin the session. Nevertheless, I've knocked a star off which is a shame because otherwise it is a brilliant product. Our 2 year old LOVED book 1 and we were excited to buy book 2 for her. The writing quality is still very high but it seems like huge corners have been cut in terms of production. The stickers are such poor quality, they are impossible for her to take off the sheet herself without ripping them as she did with book one and are definitely not reusable as book 1 ones were (meaning we could retell the stories without having to buy another copy of the same book, helping with the cost). The illustrations on the stickers are different to those in the bible so she often can't find the correct sticker from the passage by matching the pictures. Don't cut corners on the production of these books!! They are too good!